Following the rapturous reception received by Goold’s treatment of Richard II was always going to be a challenge; the highly experienced Richard Eyre was assigned the task of continuing The Hollow Crown through Henry IV parts I and II, and on last night’s offering is set to deliver a textually inventive if slightly visually austere riposte. Overall The Hollow Crown concept has been left a little exposed – clever and audience-enticing as it may be – as the stylistic dissimilarities mean that, other than the continuation of history, there is little in Henry IV part I that audiences would recognise from the filmic vistas of Goold’s Richard II. Fortunately Shakespeare is not constrained by the straightjacket of slick BBC publishing. Henry IV part I is a play that needs no extra gloss; it contains his most-loved character in Falstaff and gives the audience, as Simon Schama pointed to in his recent documentary, a view of England from the bottom-up. This is in direct contrast to a Richard II that inhabited the world of kings and noble elites. It’s also a play in which Shakespeare sketches out, in Prince Hal, the images that he would shade in later in one of his greatest creations, Hamlet – complete with two fathers (Falstaff and Henry IV pre-empting Claudius and the Ghost) and a play within a play (the great Act II Scene IV where Hal, in the guise of his Father, banishes Falstaff). 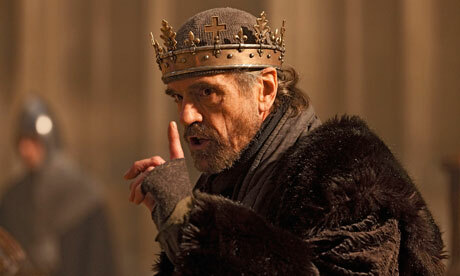 There is a seismic shift in language between Richard II and Henry IV. The world of Richard’s verse has been replaced by the more naturalistic prose of Henry Bolingbroke, now Henry IV. It serves to emphasise the working people that inhabit the play; the phrasing and speech reflects the way people actually talk to one another. It reflects a changing England; the shattering of Richard’s divine right and replaced by a, now frail and ill, Henry IV paranoid to the threat of conspirators. There is no place in this landscape for the playful verse that marked Richard II. This point is rammed home by Shakespeare through Harry Percy who ridicules and undercuts the fanciful imagery put forward by Glendower about his birth. 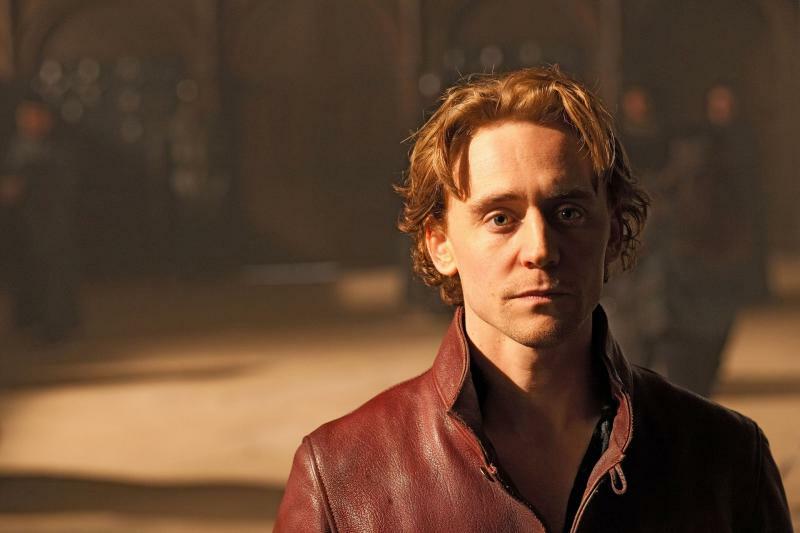 The core of Henry IV is not, of course, the King but his son, Prince Hal. Falstaff may steal the show but he is not the heart; the heart is the relationship of Hal to his two fathers, the King and the Fool, and the inevitable renunciation of the latter in order to safeguard the former. In this production Eyre appears to have taken a very deliberate step to recast Hal and Falstaff’s relationship away from the loving underpinnings with which it is normally shown. It is usual to show a warmth and affection in Hal when he undercuts Falstaff’s numerous embellishments but here there is coldness in Tom Hiddleston’s Hal. This is introduced from the very opening scenes of the play and Hal’s speech where he talks of renouncing his way of life; it is delivered in voiceover and there is an added potency to lines like ‘So when this loose behaviour I throw off’ [I.ii] given out in contemptuous manner at the same time as Hiddleston’s Hal strides through the Boar’s Head. Outwardly he is smiling, winking, interacting, whilst his interior monologue makes clear he understands that he is just playing a part that will be discarded. With this interpretation a darker light is cast over the young prince than he is often given. He realises these are just temporary bedfellows who will be left behind and retaining some emotional distance will be necessary. In light of this foreknowledge the constant trickery of Falstaff seems cruel; Poins may be mainly responsible but Hal needs little encouragement to become involved. Set alongside the ‘anon anon’ baiting of Francis and the stealing of Falstaff’s signet ring whilst he is sleeping, we are left with the impression of a prince that uses his elevated status to bully those beneath. The stealing of Falstaff’s ring is an important moment in their relationship. It is both a comic scene where Hal and Falstaff engage in banter before all is to change but it is also Hal’s final test of Falstaff, giving him every opportunity to demonstrate he can change but Falstaff inevitable fails to recognise this and misses the chance. The actions as Hal exits, leaving messages to be delivered, and the final line of ‘The land is burning; Percy stands on high / And either we or they must lower lie’ [III.iii] is of someone who has long understood that when the transition to ‘heir-apparent’ comes, it must be swift and it must be unsentimental. Falstaff will not be given another opportunity. 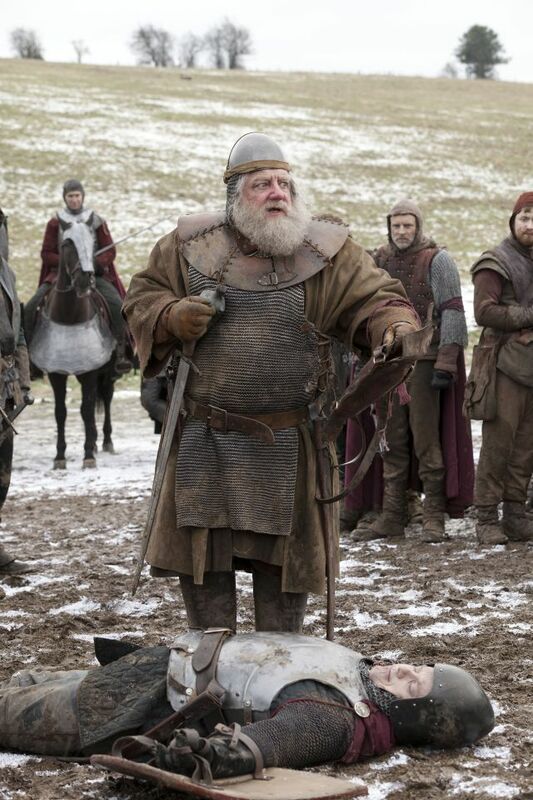 This rejection is reinforced at the end of the play as Hal meets Falstaff claiming he slew Harry Percy. In agreeing to be complicit in the lie, Hal’s ‘For my part, if a lie may do thee grace, / I’ll gild it with the happiest terms I have’ [V.iv] is given with a resigned laugh. It is the response of a man grown tired of the entanglements of Falstaff’s wordplay and has moved onto more important matters, witnessed in the subsequent ‘The trumpet sounds retreat; the day is ours / Come, brother to the highest field, / to see what friends are living, who are dead’ [V.iv] that makes clear that this is no time for petty games. Hiddleston is excellent as Prince Hal. If he does not quite match the heights of Wishaw’s Richard II it is possibly because the dialogue does lend the same opportunities. However the upcoming Henry V should give Hiddleston amply speech-making opportunities. Most impressive in his repertoire is his grasp of the non-verbal. The moment when Poins’ tells Hal that the Earl of Worcester has stolen away, we see pass across Hal’s face the knowledge that the moment of transition has arrived and that the process of abandoning Falstaff must begin. Many people have been awaiting Simon Russell Beale’s Falstaff with interest and it is likely that some will be disappointed. Whilst the direction Falstaff is taking in is valid, if uncommon, there is a more fundamental problem that must lie with the actor. Falstaff is a bear-like man, his appetites monstrous, an arch-manipulator and someone who would continually disadvantage others to advance himself. However Russell Beale never sounds anything like a dissolute man who has spent a major part of his life living on disreputable means. There is a softness, almost cherubic quality, to his voice and an innocence to his face that means this Falstaff never really convinces. Unlike many versions of Henry IV part I, the rebellion of Harry Percy and the northern lords is not lost beneath the Falstaff/Hal dynamic. Jeremy Irons is excellent, providing some of the most high-class ‘thesping yet seen in the series, as the ailing Henry IV, and the cast of northern lords in revolt provide a strong counterpoint, in particular the headstrong Harry Percy. As director, Eyre takes a fairly conservative approach to the interior shots and as a result some of the action seems a little muted. The Boar’s Head never seems to be quite the raucous hive of activity that I always expected. There may be a limit with what you can achieve given the scenes but even the colour palette of the sets and costumes seemed a little dull – all muddy browns and deep reds– whilst the lack of interior space lent it a rather oppressive stagey atmosphere at times. This was thrown into even sharper contrast by the superbly filmed battle scene – an area that really demonstrates what TV can add above a staged production. It ranks amongst the most impressive medieval battles that have yet been filmed. Given the budget naturally restricts the scale of the armies, Eyre masterfully managed the action to convey the tumultuous confusion of the battlefield and the way that trained armies descends into primal mud-soaked brawling between indistinguishable pockets of rival soldiers. Overall another impressive production from the BBC and the faith that they have put in this cycle continues to be repaid. It may not have quite hit the heights of Richard II but it perhaps ventured a more radical interpretation of the text, and it left with interesting questions over how the decisions taken on the Falstaff/Hal dynamic will impact on one of the most potential tragic scenes in Shakespeare and in what form Hiddleston will take the transformation of Prince Hal into King Henry V.